The Hour of Code takes place this week – a global event during Computer Science Education Week that aims to teach students around the world how to code, by starting with just a one-hour introduction to coding. Here are just a few interesting facts about coding, and why learning it matters now more than ever. 1. The students love it! 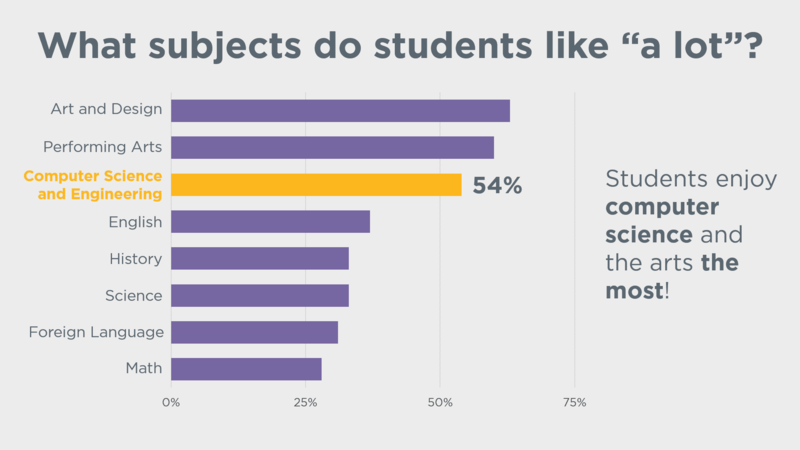 When asked which subjects high school students like, and on a scale “dislike a lot” through to “like it a lot”, 54% said that they liked computer science and engineering “a lot”, making it the third most liked school subject, closely following the Arts³. So when is the best time to start? Linguists say now! Learning to code is often compared to learning a foreign language⁴, as they both require knowledge of new sets of grammar and vocabulary. And linguists have continually found that the younger you are when learning a new language, the easier it is to pick up fluently⁵, with children’s brains being more receptive to new systems, as well as exploring these systems more creatively. The skills acquired when learning to code are known as computational thinking, which allows you to break down complex problems into manageable pieces, recognize patterns, focus on the core details, and then come up with an efficient solution⁶. Research has shown that learning to program in early childhood can increase children’s problem-solving⁷ and sequencing skills after even just a few hours⁸. 4. Who was the first coder? The question of ‘who the first coder was’ is a tricky one to pinpoint, as the definition of coding is forever changing. Many would say Ada Lovelace: she was a mathematician, working with Charles Babbage’s Analytical Engine computer in the early 19th Century. She went on to develop several ‘computer programs’ for the device, including the manipulation of symbols and creation of music⁹. 5. Girls in STEM – on the rise! STEM (the study of Science, Technology, Engineering and Mathematics) education has historically been a male-dominated field, with girls receiving less exposure and encouragement to try out the more scientific fields¹⁰. In recent years, however, we’ve seen more girls interested in STEM than ever before, with the number of girls taking AP Computer Science exams nearly tripling in the last 2 years alone¹¹. This is due to the amazing work being done by organizations like code.org, GirlsWhoCode and BlackGirlsCode, fighting to promote diversity in tech and break stereotypes. So where’s a good place to start? The Hour of Code website hosts details for 200,000 free coding activities across the whole world and online, and are designed as perfect introductions to the world of programming. At Tech Will Save Us, we’d love to see a world where everybody has access and ability to learn to code. To encourage this, and to celebrate Hour Of Code and Computer Science Education Week, we’re offering 15% off our top coding products* – including our BBC micro:bit bundles, and our Creative Coder Kit – kits that aim to teach coding to kids (8+) through play, using drag-and-drop coding to create awesome wearable tech, robots, and other awesome craft projects. Just use the code HOUROFCODE at cart! *Terms and conditions apply. This code is only valid on the following products: Creative Coder Kit, micro:bot Pack, micro:craft Pack, micro:maker Pack, micro:master Pack, micro:mega Pack, micro:mods Pack, Super Mods Pack, Code Lights Action Pack, Coder Champion Pack, Crafty Coder Pack, Electro DJ Pack, Family Craft Pack, Super Mods Pack. Deal expires at 8 am GMT on December 10th, 2018.